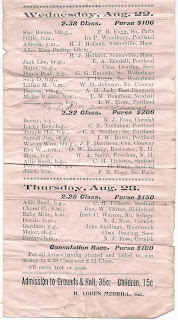 Official List of Entries of the Ossipee Valley Union Agricultural Association, Cornish, Maine, from the year 1900, if I'm reading the handwritten notation correctly. The entries consisted of horses from Maine, New Hampshire and Massachusetts. All races were open to trotters and pacers. The list is approximately 12-1/4" x 4-1/2". The Ossipee Valley Union Agricultural Association is now known as the Ossipee Valley Agricultural Society. There's another handwritten notation that is possibly "We had a ? shower", but I'd like to hear your interpretation. 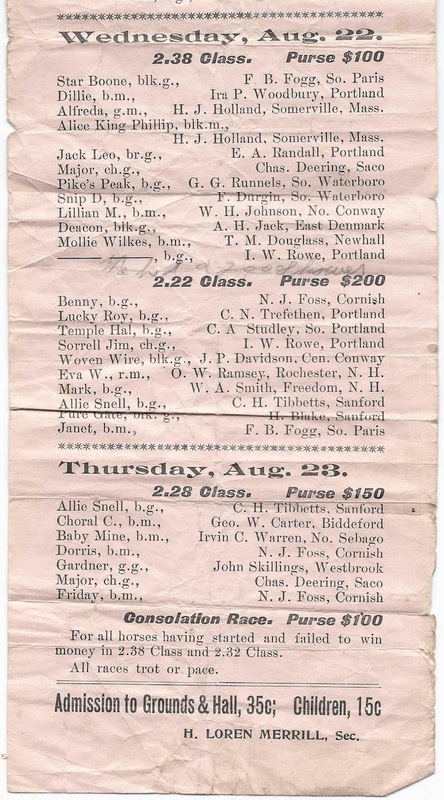 This list was found in an archive of papers that belonged to Loring Dunnells of Cornish, Maine, a Civil War veteran and farmer, who was born at Shapleigh, Maine, on 15 August 1838, son of David and Mary (Brown) Dunnells. The archive consists of many receipts, pension forms, a deed and such. Another post features what looks to be Loring's invitation to the 1864 Washington's Birth Day Ball at Limerick, Maine, with music by the Ira C. Seavey Full Quadrille Band. Loring Dunnells' first wife was Almira B. Weeks, daughter of Samuel and Susan (Eastman) Weeks. They were married on 26 June 1865. I don't believe they had any children, at least living children, before Almira died on 17 March 1872. Loring next married Nellie Flora Storer, daughter of George and Caroline (Warren) Storer. Loring and Nellie had at least three, possibly four children. Loring died in 1922 and Nellie in 1936. If you have information on H. Loren Merrill, or any of the owners or horses mentioned above, please leave a comment. Thanks!